Halloween | Stand Up and Speak Out! Halloween morning the other girls slept in but my body is used to waking up between 7 and 8 and sure enough I was awake by 8. So I spent the quiet time working on Fred’s birthday present (more on that in a later post). Once I popped the crème brulee French toast in the oven, though, the girls started to stir. 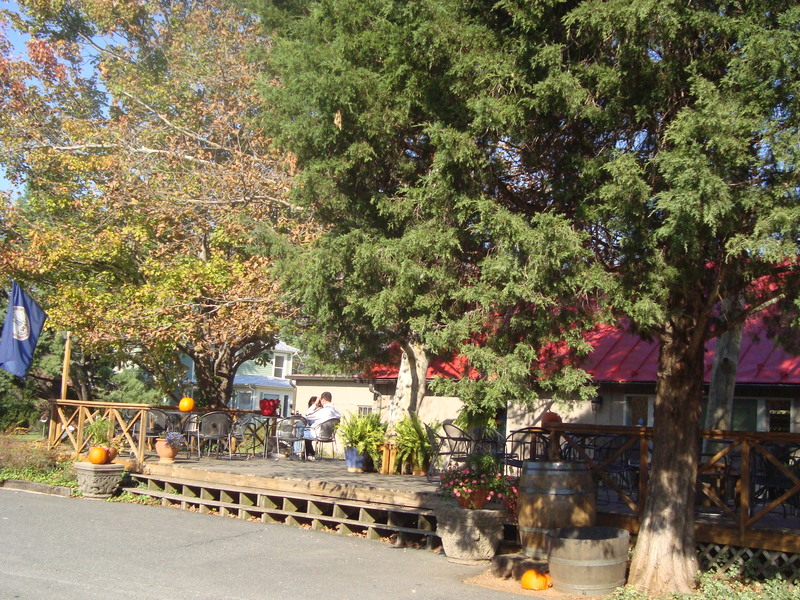 After the delicious breakfast, we headed out to our first winery for the day, Jefferson Vineyards. It rests just south of Monticello on land that was originally Jefferson’s. He had something like 5,000 acres of land and part of it was for growing grapes for wine. The vineyard isn’t that big now, of course, but it rests on his land, ergo the namesake. The tasting room was busy, but there were plenty of people to pour wine and still take the time to chat with us. They asked for the tasting fee up front (some wineries wait until after the tasting and if you buy a bottle, will comp the fee). However, the glasses we used were for us to keep. They were nice, too, with the vineyard’s name etched in them. We went on a short tour of the vineyard then. Even though we’d already been to three wineries that weekend, this was our first tour. After a brief history lesson, our guide took us around the outside of the facility. He showed us the crates the grapes were placed in and then the two pieces of equipment used to extract the juice. Which machine they used depended on if they were making white or red wine, which actually had nothing to do with the color of the grapes. Who knew? Red wine grapes start the fermenting process right away and their skins are left on to extract the color into the wine. Then after fermenting for however long they need, they are squeezed. White wine grapes are squeezed first and then fermented. Inside the facility, we saw the steel fermenting containers and a room full of barrels of wine. Each barrel holds approximately 300 bottles worth of wine. The guide explained a process for getting the most flavor out of the oak barrels. I can’t even describe everything that has to be done to the wine but let me just say that I never knew that so much work went into the aging process! No wonder wine is so expensive. After the tour, we bought a fair amount of wine and had the cashier open a bottle for us. We took it, along with a cheddar cheese ball and crackers, outside. The Monticello area is filled with trees and hills. 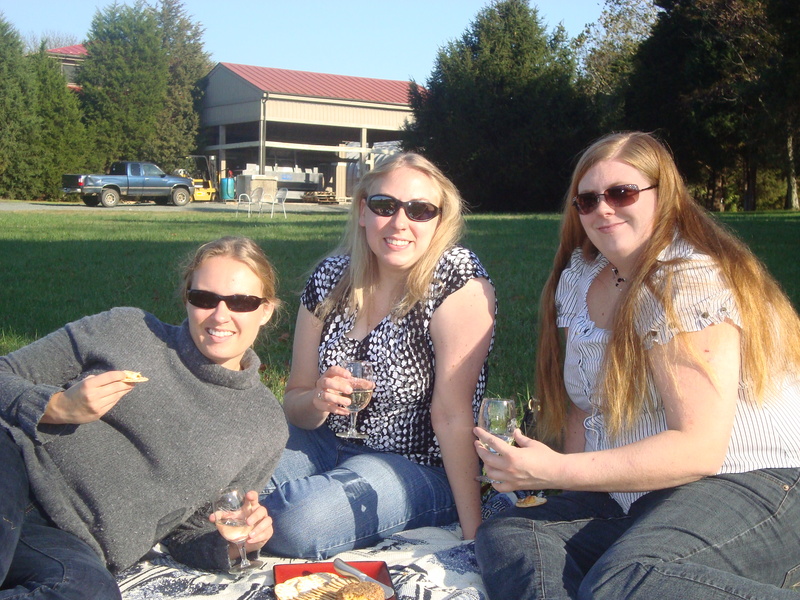 So we sat atop the vineyard hill and sipped and ate. The sky was a bright blue, the trees were turning, and the sun was warm. It was nice to sit and relax for awhile. There were other vineyards on our list and other activities as well, but we didn’t want to rush around. After our midday snack of wine and cheese, we went back to Jess’ house to get ready for the trick-or-treaters. 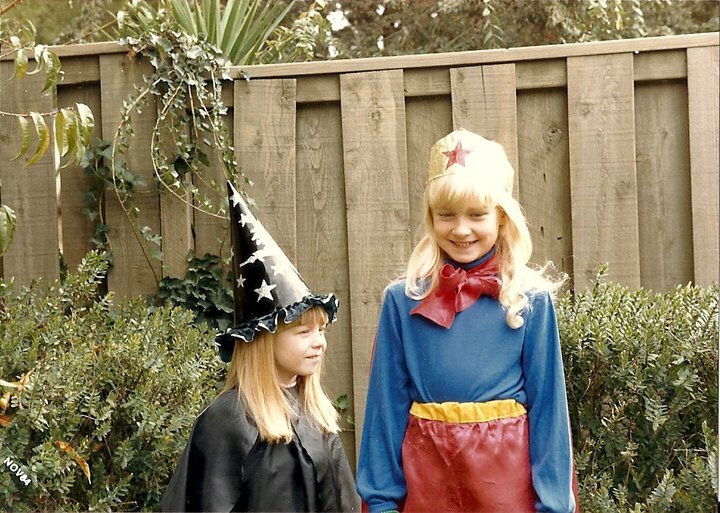 Jess dressed as a witch. 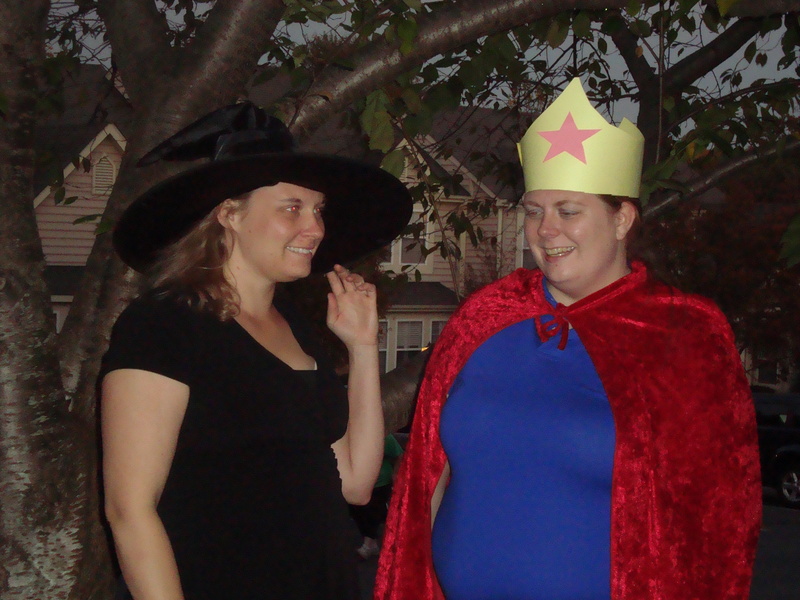 Missy was a rejected leprechaun (pretty much her outfit consisted of mis-matched green articles of clothing), I was a pathetic-looking Wonder Woman*, and Kate was a Southern Belle. She had the whole she-bang. 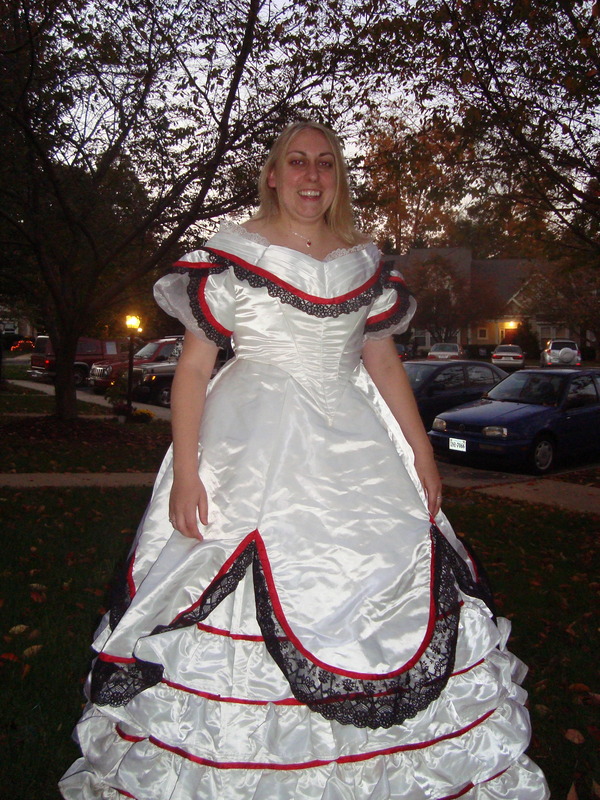 See, Kate and Missy’s family participates in a lot of Civil War reenactments and Kate had her reenactment ball gown with her. (She even sewed it herself. I was very impressed!) However, getting the costume on proved to be a challenge, a very hilarious challenge. The bodice was a bit tight and Kate’s, er, womanly features had grown since she’d made the gown. It started with Missy trying to get the bodice over Kate’s chest but it was not a one-man job. So I stepped in. We pushed and pulled but with no avail. I called in Jess to help. At that point, our faces were red from laughing so hard. It took all three of us, pushing and pulling, to get that damn bodice onto Kate’s body. In the end, though, she looked really good. We sat outside to welcome the trick-or-treaters. There were some really cute kids. The most memorable ones were the young, charming boys. 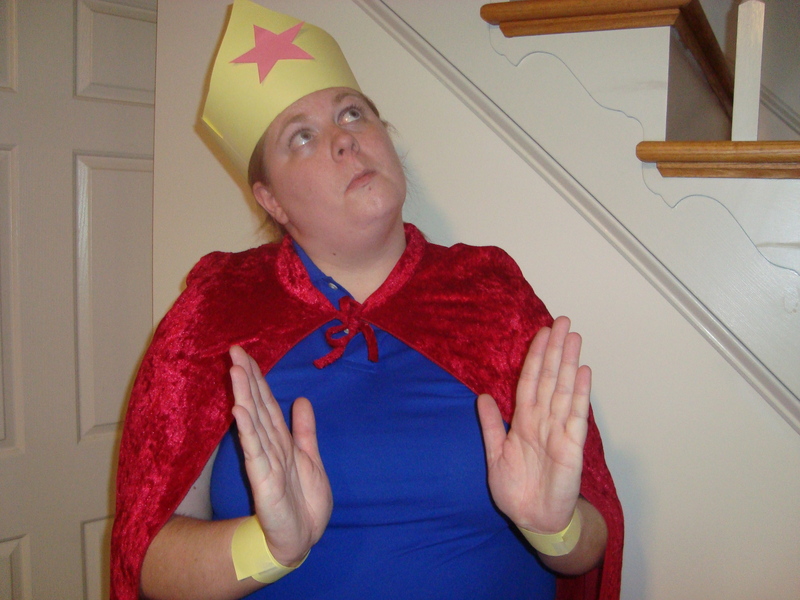 One seven-year-old was dressed as a prince, with a gold crown and a red robe. He walked up to us and proclaimed, “I’m a prince!” So much for saying “Trick or treat”. He thought Kate was a princess and she went along with it because who wants to explain a Civil War Southern Belle to a seven-year-old? Before he left, I heard him say to Kate, “Prince and princesses belong together.” Another charmer was a three-year-old dressed as a dinosaur. He was rather shy but with a little push from Dad, he came up to us and held out his bag. He didn’t say anything. Kate asked him if he could roar so he gave out a meager “Rawr”. We all acted impressed and scared so he roared again, this time louder. Again, we pretended to be terrified. A smile lit up his face as he watched our reactions. He roared again, even louder. Later, we could hear him roaring at the neighbors’ houses. Obviously, we’re not wearing the original costumes. We cut the evening’s activities short because we had to be up early to head out on the road. Missy had to work Monday evening and Fred had tickets to an NFL game for us (more on that later). So, after a brief stint of sleep, we headed back on the road at 4am. It’s not my favorite time of day, that’s for sure, but there was little traffic and overall, we ended up making great time. Yes, it was a lot of driving for a 4-day weekend but it was worth it. I love my sister and my cousins and being around them made it all worthwhile.